Animoids allows you to create animated drawings in three dimensions thanks to its complete tools. Thanks to this software you will be able to take part in the creation and modeling of drawings in 3D to create all kinds of animated videos. This program is especially recommendable for those that want to start in the 3D modeling world. The traditional hand drawn drawings are in disuse due to the strong rise in the new animation systems. Thanks to the technology, the creation of contents in 3D it has popularized. With Animoids, also known as Animoids 3D Movie Maker, you will be capable of creating anything, with the added bonus of starting off with an existing model if you are afraid of starting from scratch. To do so you will have a large amount of textures and colors available as well as redimension tools, and many visualization options so as to avoid missing any detail. It's possible to modify each one of the elements that form your figure, as well as to provide it with movement thanks to an internal sequencer. Thus, you'll be able to create your own animated film. Furthermore, you'll be able to print your creations or share them with the rest of users over the Internet. 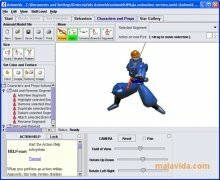 If you're still green regarding the creation of 3D animations, you can check the internal tutorials of this software application. Let your imagination fly with Animoids.